220cm long, 100cm wide, 100cm high. 300 kilos. 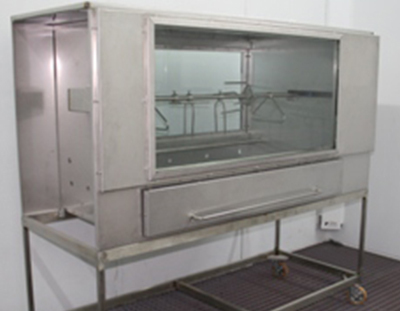 Stainless steel door, one or two glass viewing panels. Can be mounted on a trolley. Will run on natural gas or propane. Inside or outdoors. 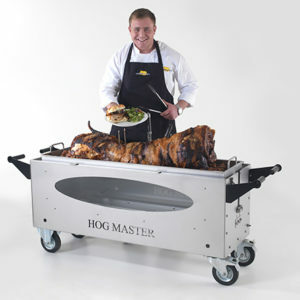 These hog roast ovens can be used indoors or outdoors and run on natural gas or propane. They can be used inside a restaurant or kitchen and make a great addition to your food offering. They can cook two pigs at once or a pig and 8 legs of pork giving you a continual steady supply of cooked pork. They can also be used to cook other things to accompany your pig. 220cm long, 100cm wide, 120cm high. Weight 300 kilos. Will run on natural gas or propane. 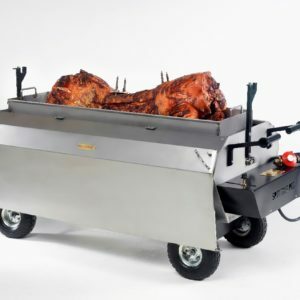 This roaster can be used in doors in a kitchen or restaurant or catering trailer, or out doors built into a bbq area or as a mobile unit mounted on a trolley. It can run on propane or natural gas. It has lights so looks super when serving during the evening. This is a very well built robust roaster that will run seven days a week with out a break. It will last for years with very little maintenance and will still look as good in years to come. This machine is built to work hard and last for years. 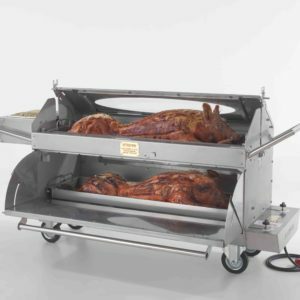 The machine can spit roast a whole pig, lamb or several turkeys or 35 chickens and cook a selection of joints of meat (up to 8 large joints) or a 100 jacket potatoes, 4 large turkeys etc at the same time. Will cook up to a 75 kilo pig head off, or 60 kilo head on. Cooking time 1 hour for every 10 kilos of pig. Will cook 40 chickens in 1.5 hours. 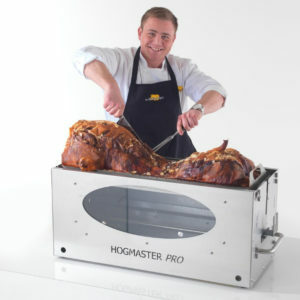 Can be used to cook a variety of joints of meat for a carvery. Will cook up to a 75 kilo pig head on, or 85 kilo pig head off, and two boned and rolled legs and 150 jacket potatoes at the same time.